infiltration and exchange of chemicals in the specimens. 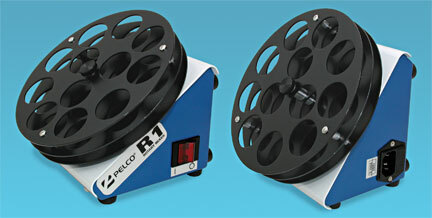 The slow rotational speed of the PELCO® R2 lends itself to EM tissue processing techniques. Slow rotation is recommended for processing specimens and leads to more complete infiltration without air mixing, giving improved results for tissue preparations. The PELCO® R2 has rubber cushioned feet on the bottom as well as on the back so it may be placed on either of two angles, 35° from horizontal when placed on the "bottom feet" and 55° from horizontal when placed on the "back feet". A high torque motor maintains constant speed at full load. Variable speed is easily set with a rotary control. Rotational speed is less than 1 to greater than 7.5 rpm. 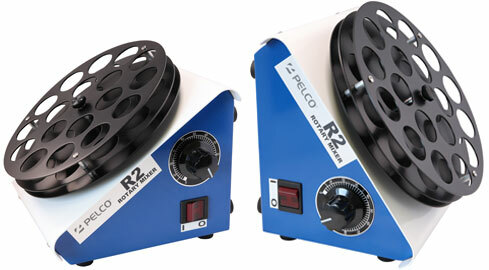 The PELCO® R2 has been tested under heavy load conditions to assure reliability. 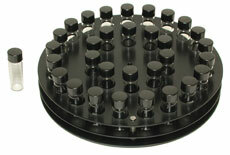 A black-anodized head (1051) with 18 holes for bottles or vials up to 30mm in diameter comes with the R2. Our #12706 Snap-Cap® Vials are used in this head. Optional head is available (1054). Solid top black phenolic caps with 14B white rubber liner are attached. The vials are manufactured from Wheaton 33® low extractable borosilicate glass (meets ASTM Type I Class A and USP Type I Standards) to protect against changes in pH and maintain purity of contents. They have uniform sidewall and bottom thicknesses, are lightweight and have excellent strength and clarity. Storage down to -40° C.
This small, economical rotator is suitable for electron microscopy preparations. It has a slow speed of approximately 10RPM. It is effective for gentle and thorough infiltration of solvents and embedding plastics. The Rotator head has twelve holes which accommodate vials up to 30mm in diameter. Our #12706 and #12708 Snap-Cap® Vials are used in this head. See additional head below for up to 16mm diameter vials.